The Ridgid 14" Right Angle Pipe Wrench is an easy to use tool for occasional home improvement, yet sturdy and versatile enough for more rigorous use. Think of the right angle pipe wrench like a heavy duty basin wrench because it allows you to turn pipes and fittings in spaces where you cannot fit a normal pipe wrench. You may not need it every day, but when do you need it, you’ll be glad you have it. 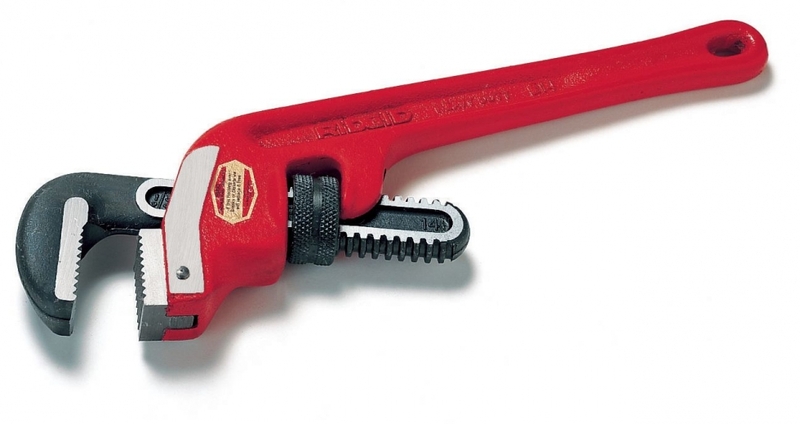 The wrench head works just like any other pipe wrench, except it does not have a handle. Instead, it features a square socket on the side where you plug an extension bar that runs perpendicular to the head. If necessary, the T-handle also fits directly into the wrench head.